After a long wait of almost half a century, filled with more twists and turns than the river Narmada’s, the Sardar Sarovar project is finally complete. Prime minister Narendra Modi dedicated the multipurpose project to the nation on Sunday, which also happened to be his 67th birthday. On the occasion, he addressed a large gathering of people in Dabhoi district in central Gujarat, and termed this project an engineering miracle which had also overcome numerous hurdles. While the PM remembered Sardar Vallabhbhai Patel for his dream of making a dam on the Narmada and also gave credit to Dr BR Ambedkar, he skipped mentioning Jawaharlal Nehru, the first prime minister who had laid the foundation stone of the project in 1961. “No other project in the world has faced such hurdles as the Sardar Sarovar dam has. But we were determined to complete the project. It is now standing tall on the Narmada giving water to millions of people of Gujarat, Maharashtra, Madhya Pradesh and Rajasthan. It all happened with the support of the people of the nation,” Modi said. As the pandal reverberated with claps, the PM listed out some of what he saw as false allegations, conspiracies and political machinations in the way of the project. “But I am not going to name anyone as I do not want to go down that road. I believe in working. I will continue doing that,” he said adding that the World Bank too had refused to fund the project due to misinformation spread by about it. “Even the World Bank, which had earlier agreed to fund the project, refused to give loan for it. But I was clear that the dam will be built, even if it had to be built without the World Bank’s money. You all helped me. Seers of Gujarat steeped ahead for the project and temples have sent money to me for its completion,” Modi said adding that he (as Gujarat chief minister) had done so much environment-related work in Gujarat that later even the “same” World Bank was compelled to give the state a Green Award following the state government’s rehabilitation work after the 2001 earthquake in Kutch. The World Bank had refused its grant for the project in 1991, after an independent evaluation pointed to environmental damage and human rights violations. The Narmada Bachao Andolan (NBA), led by Medha Patkar, filed a petition in the supreme court, leading to a stay on further construction in 1993. The apex court cleared the project in 1999. 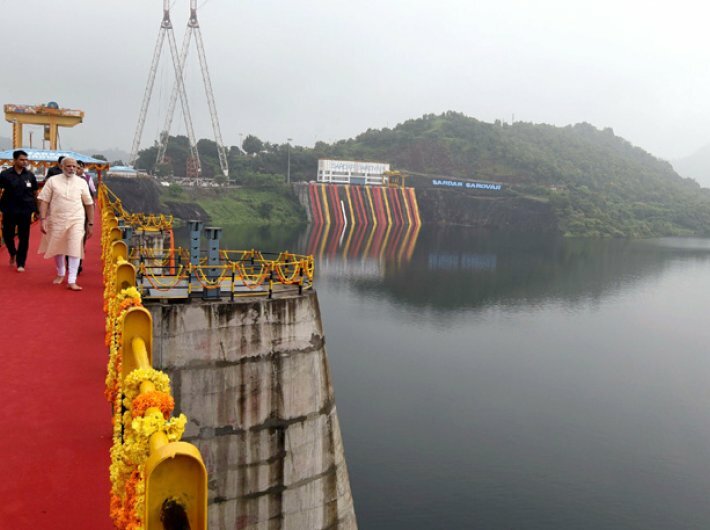 The Sardar Sarovar dam is intended to provide drinking water to 131 urban centres and 9,633 villages (53 percent of total 18,144 villages of Gujarat) and irrigation facilities for 18.54 hectares of land covering 3,112 villages under 73 talukas in 15 districts. It is the country’s biggest dam in terms of concrete used. “Log yaha tak bole ki humne itna concrete istemal kia hai ki Kashmir se kanyakumari tak 8 feet chaudi road ban jaye. Logo ne to kya kuch nahi kaha,” Modi added. He also remembered Ambedkar on this occasion and claimed that people have no idea how Ambedkar had shown a new way to the nation in terms of water and river conservation. Thanking the tribals, Modi said that no one had ever tried making the new generation know the tribal leaders and the central government hence has decided to make a fully digital tribal museum at the convention center of the dam. The Statue of Unity, being dubbed as the world’s tallest statue, when completed, will also be a part of the SSP, the PM said, which according to him will bring both tourism and employment to the tribal belt of Gujarat. “You know me, I can’t do small things. I don’t think small, don’t do small things. With 1.25 billion people with me, I can’t dream small,” he said while telling people about the Statue of Unity whose maximum parts are being imported from China, including the machinery and bronze. Among those present at the event today were union minister Nitin Gadkari, Gujarat governor OP Kohli, chief minister Vijay Rupani, deputy chief minister Nitin Patel and former chief minister Anandiben Patel.